Shane Chartrand from the Enoch Cree Nation and has been cooking his entire life, and this week he will be the guest curator of the xREDx Talk: “Eagle and Condor" a celebration of world Indigenous foods. The talk will be held July 6 at Enoch, which is also hosting the World Indigenous Nations (WIN) Games this week. Chartrand is a graduate of NAIT’s culinary arts program, and is the chef of the Sage restaurant at the River Cree Casino at Enoch. “I cook Canadian Aboriginal-inspired food,” he told Jeremy Harpe of CFWE-FM. “The first kind of cuisine I ever got into was Japanese cuisine… really deep into that,” Chartrand said. 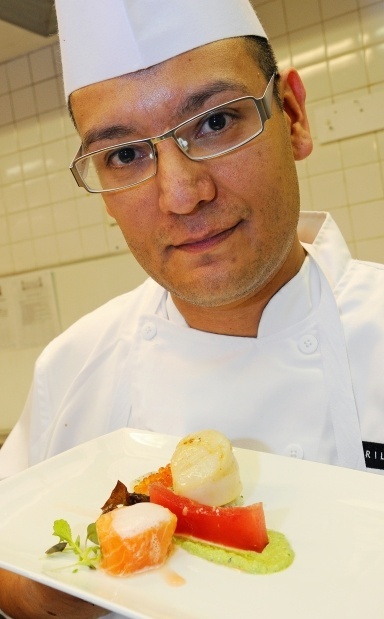 But then Chartrand noticed the similarities between his own Plains Cree cuisine and Asian cuisine. And that’s why he has focused on Aboriginal fare. Chef Chartrand is an artist at heart and his food is not only tasty, but beautiful too. While searching around for a career, he knew he wanted to focus on the creative side and decided that culinary arts was right up his alley. And from that realization he has created his own identity. He created a Twitter storm a couple of years ago with a dish called War Paint, a smoked game hen with roasted squash, Red Fife wheat berries, with a red pepper hand print on the plate to represent war paint. Originally, when asked to be part of the RedX Talks, a non-profit speaker series that expresses and embodies Indigenous world views from Elders, teachers, youth and allies, it was as the caterer. But he doesn’t cater. “I do fine dine, high-end, styled Aboriginal food,” Chartrand explained. So he was going to decline the experience, but then someone from the RedX organization heard him speak. That’s when he was asked to do a presentation, and so Chartrand signed on. He also signed on to organize a feast for the WIN Games. Chartrand recruited 10 of the best chefs in Alberta. They are going to cook open fire for the people. There will also be guest curator speakers, including one of the biggest chefs in all of Australia, Jock Zonfrillo. After all the excitement from this week calms down, Chartrand will continue promoting and protecting food sovereignty and food belief systems in Indigenous communities.